Whoa! Rolemodels opens this Friday, October 25th! And everyone's invited! This is an epic show filled with 100 pieces of amazing art! 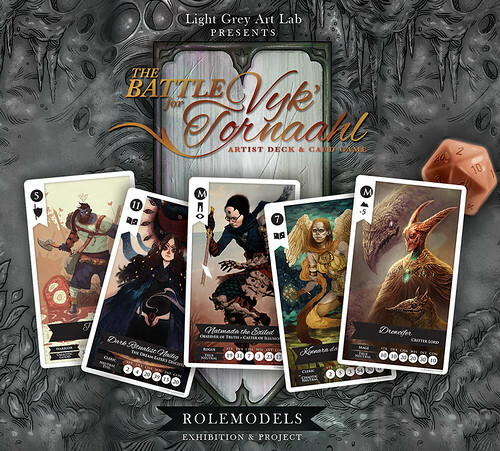 Not to mention we're officially launching our brand-new card game, The Battle For Vyk'Tornaahl, featuring all the artwork from the Rolemodels show! This show has been a long time coming, and we couldn't be more excited. We've been so busy making costumes and props (and playing The Battle For Vyk'Tornaahl) that the month has flown by! But what better way to celebrate that an opening filled with art, games, food, costumes, friends and fantasy? This will be most people's chance to check out The Battle For Vyk'Tornaahl, and we're excited to finally be able to share it with everyone! 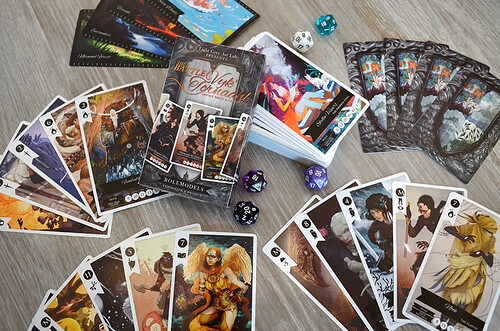 We'll have an area to learn and try out the game at the opening, and don't worry, despite the 100 card deck and 100 page guidebook, it's actually really easy to learn. You'll be able to battle against the best of 'em in no time! Again, the opening reception runs from 7-10 PM. We've got a lot of fun stuff lined up! Play the game, of course, but also drink some Goblin's Cure or Witch's Brew mixed drinks, and wear a costume for a chance to win free artwork or a copy of The Battle For Vyk'Tornaahl card game! For more information and to RSVP, visit our Rolemodels Facebook Event Page! See you there!